An article appears today in the EASTERN DAILY PRESS about Flight Lieutenant Bryan Wild’s memoirs of his time in East Anglia with 26 Squadron from October 1944 to June 1946. Mrs Halls, 56, from Herefordshire, said reading his diaries was like meeting her father when he was in his 20s. She said: “Diary entries are very different to how people present themselves. It was quite extraordinary reading my father’s diary. When I was growing up he never talked about the war. When I read the diaries I felt as though I was with him in the cockpit. Before arriving in Norfolk, Flt Lt Wild flew with 46 Squadron from Egypt and Cyprus between 1943 and 1944. While at Coltishall between October 10 and October 27, 1944, he flew Mosquitos which he described as breathtaking. “He liked East Anglia, its pubs and friendly local people. He was very happy there,” Mrs Halls added. The book of my father’s memoirs, ‘Flying Blind: the Story of a Night-Fighter Pilot’, is now at the press and is likely to be available from mid-October. The book is published by Fonthill Media. 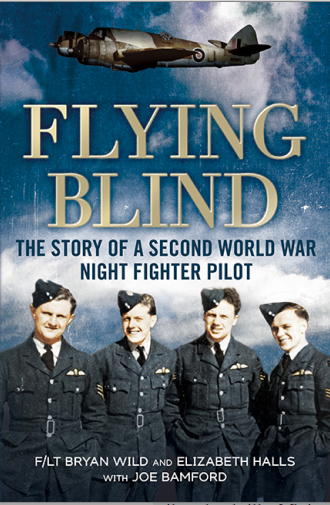 Or if you would like to subscribe to my email newsletter ‘Flying Blind’ to keep up to date with developments on the book, its publication and feedback afterwards, just complete the following form. I only send newsletters from time to time when there is something to impart, and you can unsubscribe easily at any time using the link at the bottom of each edition. That’s not a Spitfire, it’s a Defiant. I have been asked why I pictured my father with a Spitfire when he flew Mosquitos during the war. There are two answers to that. The first is that Dad flew 14 different aircraft altogether (not including different marks of aircraft). The second is that it’s not a Spitfire, it’s a Defiant. 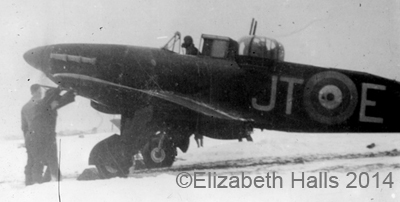 Boulton Paul Defiants flew in the Battle of Britain, but were better designed for attacking slower bombers than interception in fighter combat. Yes, there is a similarity of outline to the Spitfire, and this meant that they could masquerade as Hurricanes or Spitfires in a crowded sky but were marked out when German fighters found them on their own, and shot down easily. The tell-tale giveaway is the perspex blister behind the cockpit on top of the fuselage: a gun turret housing the gunner, which means that is therefore a two-man plane not a solo job like the Spit and Hurricane. Defiants suffered heavy losses in the Battle of Britain, see http://www.raf.mod.uk/history/boultonpauldefiant.cfm , but the time Dad flew them in July 1941 in 456 Squadron at RAF Valley in Anglesey, and then 256 Squadron at Squires Gate, Blackpool, they were being used as night-fighter planes, defending cities in the North West from German bombing, for which they were better suited. There were still problems with them, however, and they were not universally popular. The photo shows pilot Bryan Wild and his gunner, Stanley (Ack) Greenwood, preparing for take-off in a Defiant at Squires Gate, December 1941.